I love tofu. It’s subtle flavor makes it easy to use in both sweet and savory dishes. On a hot summer day, I like to enjoy a small cube of plain chilled tofu, and during the winter, a warm bowl of tofu soup definitely hits the spot. 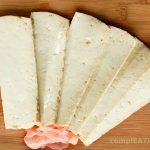 Today’s dish is a simple marinated tofu, packed with flavor, and perfect as a side dish or as part of a delicious stir fry. Remove the tofu from the package, place between two plates. Weigh the top plate down with an apple, onion, or similarly sized object. Let the tofu drain for 1/2 hour – 1 hour. Once the tofu has drained (and compacted), remove the tofu from the plate, and slice into quarter-inch thick slices. In a container just bigger than the tofu (or the rinsed out container it came in) add the soy sauce, ginger, ginger juice, and shiitake mushrooms in the container. Add the sliced tofu, and add water until the water just barely covers the tofu. Refrigerate for 2 hours or up to 1 week before serving. This tofu is perfect in the Vietnamese Lettuce Wraps I posted.